Fujitsu Limited announced that it has developed two new 500 GB(1) 2.5″ hard disk drive (HDD) models that feature a rotational speed of 5,400 RPM and deliver industry-leading levels of energy efficiency. The MJA2 BH series will be available from the end of December 2008, and the MJA2 CH series will be available in the first quarter of the 2009 calendar year. With industry-leading levels of energy efficiency, the new models consume only 1.4W of power when recording data, one-third less than previous models(2). Moreover, these are Fujitsu’s first halogen-free(3) HDD models, making them an environmentally friendly products across their lifecycle, from deployment to disposal. In addition, to meet information security needs for high data storage capacity applications, the MJA2 CH series is the world’s first 500 GB HDD line equipped with 256-bit Advanced Encryption Standard (AES)(4) encryption. As corporations and government agencies have become increasingly involved in efforts to prevent global warming and promote environmental conservation, eco-friendly IT products have been at the center of attention. To respond to these needs, Fujitsu developed two new 2.5″ HDD models, the MJA2 BH and MJA2 CH, featuring industry-leading levels of power efficiency. By increasing recording density, the new models deliver a maximum of 500 GB in storage capacity. 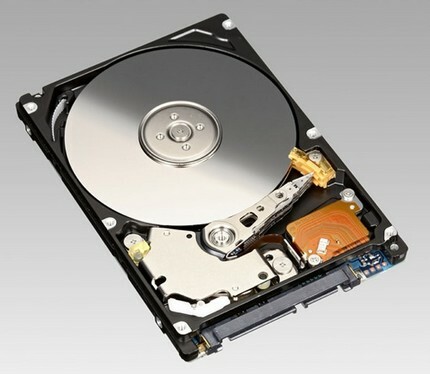 The HDDs consume only 1.4W of power to record data, a reduction of 33% in power consumption compared to previous models. Moreover, in addition to being manufactured in compliance with the EU’s RoHS Directive(5), which limits the use of hazardous substances, the new modes are also Fujitsu’s first HDD line to be halogen-free. This will minimize the hazardous substances generated at disposal. To prevent data leaks for customers handling sensitive information, the MJA2 CH model has a built-in encryption function. This model automatically encrypts data as it is recorded, and all data stored on the HDD can be erased instantly, in less than a second, using the advanced secure erase feature. These features prevent data leaks in the event a PC is lost or stolen and make it simple to erase data during disposal, thereby reducing customers’ total cost of ownership. With high storage capacity and low power consumption, MJA2 BH and MJA2 CH series target not only the expanding notebook PC market but also other markets such as desktop PCs. The HDDs are the most recent offerings under Fujitsu’s Green Policy Innovation program, which was unveiled in December 2007 to promote energy-efficient products and services as a way to help customers lower their ecological footprint. Capitalizing on the vast experience and reputation for reliability that Fujitsu has accumulated through over 40 years of HDD development, these products will deliver the superior quality and environmentally friendly features that customers have come to expect from Fujitsu.